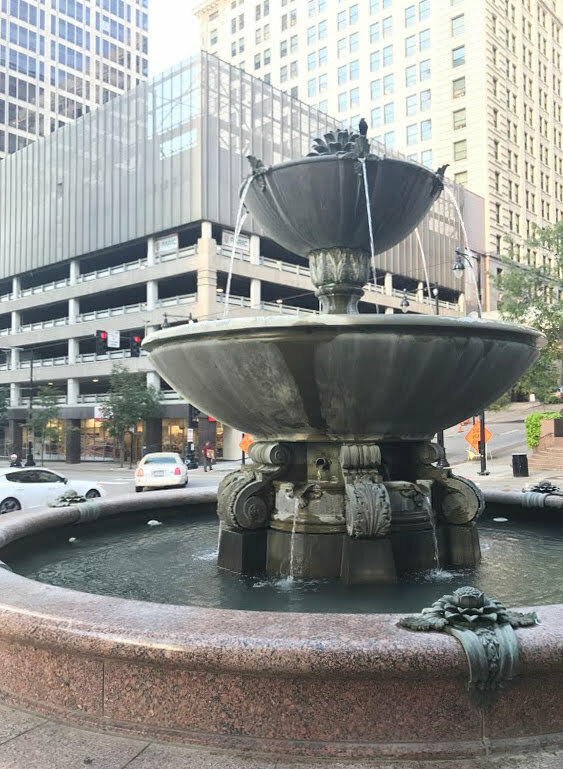 Kansas City is said to have the most working fountains in the world—more even, than Rome, Italy. Technically, it hasn’t been verified, but we won’t tell anyone if you don’t. While KC’s fountains are now used for recreation, relaxation and Insta-worthy pics, the fountains originally served a practical purpose—hydrating the horses, birds and dogs of the city. Fountains for decorative use exploded in the 1920s, after developer J.C. Nichols used them throughout the Country Club Plaza. Artist: Theis Sickbert Associates, 1989. You’ll find this two-sided fountain where Downtown meets the Garment District and Quality Hill. What’s nearby: The Peanut Downtown and their infamous buffalo wings. The Poindexter Fountain melds two art forms, fountains and sculpture. It contains bull and bear sculptures from a demolished downtown building and sits below Donald Lipski’s “Rodin Rodannadanna” sculpture. What’s nearby: The newly reopened Savoy at 21c. 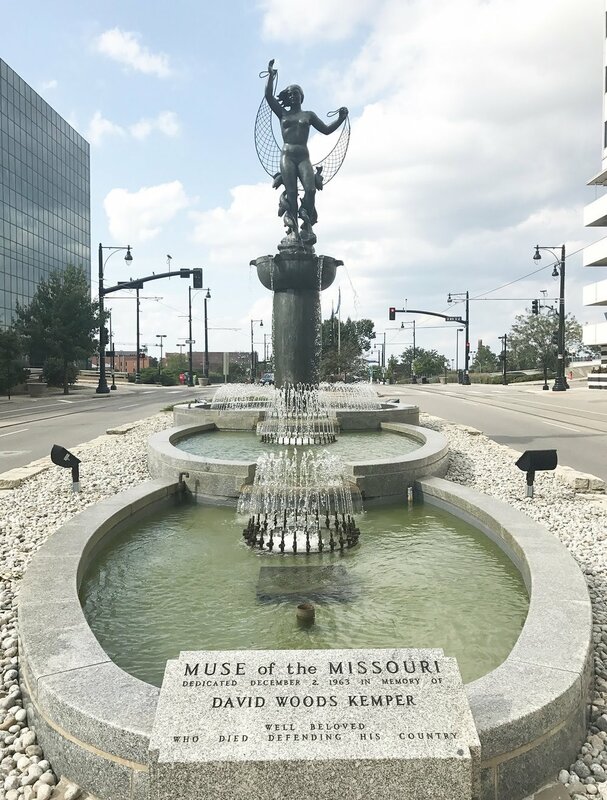 Located in the middle of Main Street, streetcar riders can catch a glimpse of the goddess bestowing her guidance on the Missouri River. What’s nearby: Kansas City’s first-ever deli, The Milwaukee Delicatessen. Artists: Lori Doolittle and Alvin Holm, 1999. The designers combined art, water and technology to honor the Kempers and their commitment to Kansas City. What’s nearby: The Kansas City Public Library’s Central Branch and its well-known giant bookshelf. Artist: Carl Paul Jennewein, 1938. The Sea Horse Fountain, complete with sea horses, dolphins and seashells, borders the terrace up to City Hall. What’s nearby: Perhaps one of Kansas City’s diviest bars, Zoo Bar. Artist: Local architects Marshall & Brown, 1985. The fountain is located on the north side of Barney Allis Plaza, a memorial to Barney Allis, well-known citizen and manager of the historic Muehlebach Hotel (now the Downtown Marriott). What’s nearby: Barney Allis Plaza, an overlooked green space in the heart of Downtown. Created by Crown Center Redevelopment Corporation, 1983. Made of 49 jets and 48 shooters, this Crown Center staple shoots water 60 feet into the air. What’s nearby: The Crown Center shops, including historic Halls Kansas City, Topsy’s Popcorn and Fritz’s Railroad Restaurant. Artists: WET Design and BNIM, 2001. Designed by the same artists who created the Bellagio fountains in Las Vegas, this fountain puts on a five-minute show, every thirty minutes. What’s nearby: Union Station’s breathtaking views and Pierpont’s stellar happy hour. Artist: Wight and Wight, 1934-35. What’s nearby: The National WWI Museum and amazing views of the city atop the Liberty Memorial. Stay tuned for North KC and Midtown Fountain Guides.